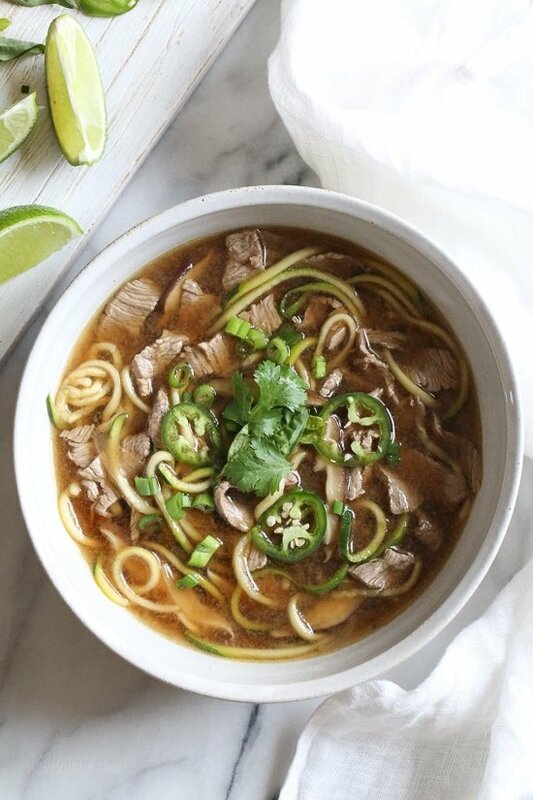 A quick, flavorful Vietnamese-inspired nood-less pho subs zucchini for rice noodles. 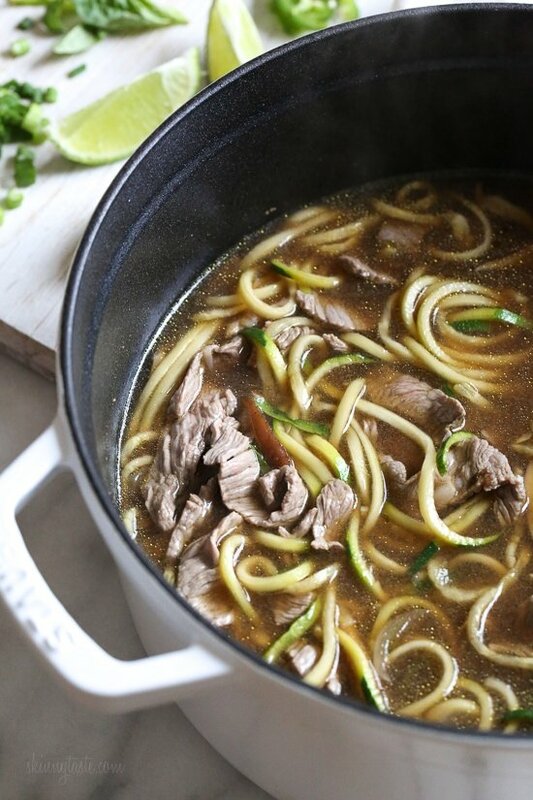 So easy, the steak is sliced thin and cooks less than a minute in the ginger-garlic beef broth. 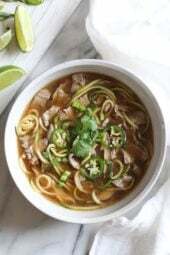 Top this with fresh lime, basil, cilantro, jalapeno and scallions and you have one tasty faux pho! 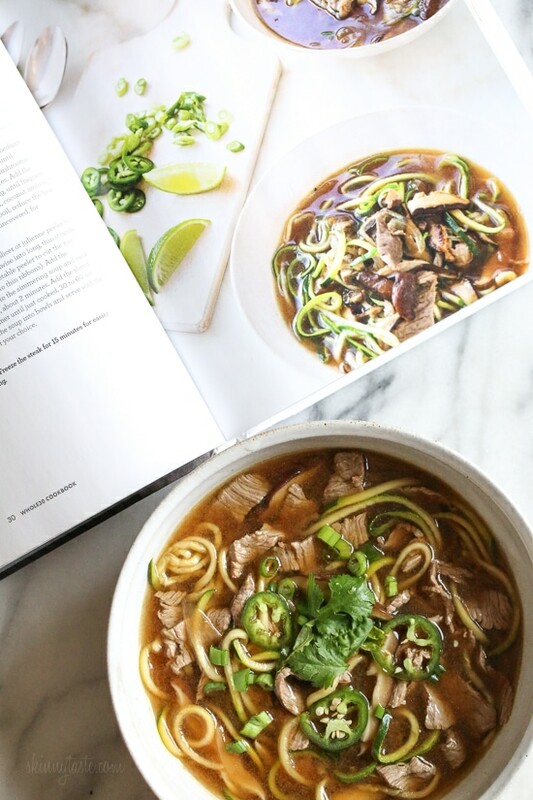 This recipe is from the Whole30 Cookbook by Melissa Hartwig, I loved how simple and flavorful this was, and of course I love any excuse to use my spiralizer! It took less than thirty minutes to make, and one bowl was very generous and satisfying. In a large pot, heat the coconut oil over medium heat. Add the onion and cook, stirring, until softened, about 2 minutes. Add the mushrooms and cook, stirring, for about 3 minutes. Add the garlic and ginger and cook, stirring, until fragrant, about 30 seconds. Add the broth, coconut aminos, fish sauce, and salt. Bring to a boil; reduce the heat to medium-low and simmer, uncovered, for 5 minutes. Meanwhile, use a spiralizer (or julienne peeler) to cut the zucchini lengthwise into long, thin strands (or use a regular vegetable peeler to cut the zucchini lengthwise into thin ribbons). Add the zucchini noodles to the simmering soup and cook until just tender, about 1 1/2 minutes. Add the sliced steak and simmer until just cooked, 30 to 60 seconds. Ladle the soup into bowls and serve with the toppings of your choice. Tip: Freeze the steak for 15 minutes for easier slicing.